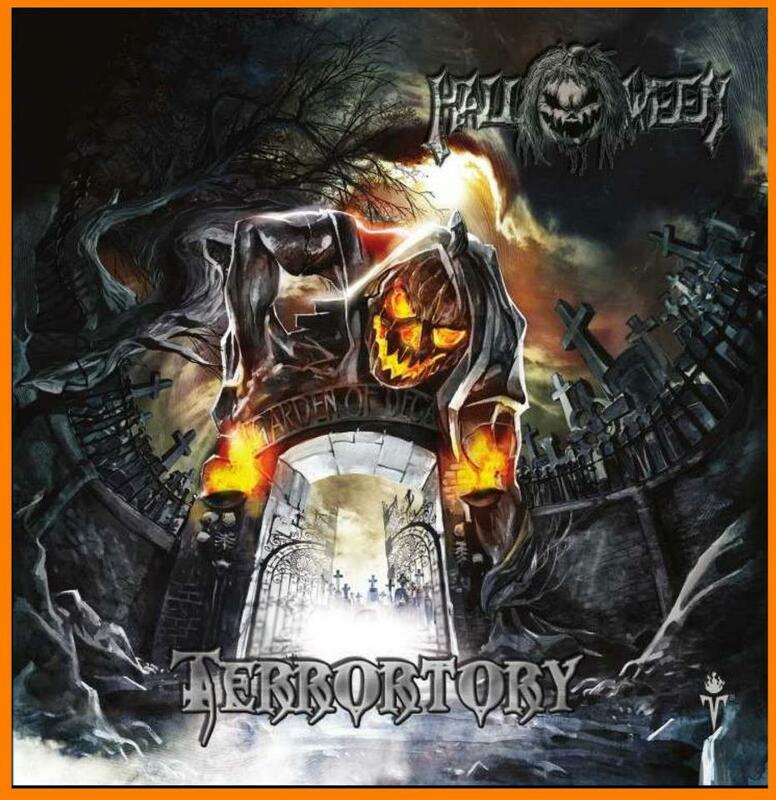 Review: "Halloween: Terrortory" - Sea of Tranquility - The Web Destination for Progressive Music! It is a hard working town that they come from. With grit and determination they forged a sound that is the embodiment of the Motor City. Since their debut almost 30 years ago, Halloween has shown the world how to rock and roll. It is about attitude. It is about metal. It is music that is as American as baseball and apple pie but with the guts and snarl that only a group from this neck of the woods could bring on. This is the real heavy metal imported from Detroit. It is Halloween and that in itself should be enough to bring a smile to the face of all the head bangers out there. With their new release, the heavy metal horror show once again shows what lurks in the shadows and the darkness within. They will make you fear what is under the bed or hiding in the closet. Halloween will remind you just what evil means! Clocking in at over 70 minutes, Terrortory gives you a gratuitous amount of the classic metal that is the foundation from which this genre evolved. Harkening back to the days of thunderous stadium rock, Halloween strives to remind you where the roots of metal come from and just how strong they are. They also take a foray into the world where things go bump in the night with a kind of retro feel that makes me think back to the days of the Saturday creep shows that were the domain of Sir Graves Ghastly and The Ghoul. So just sit back and enjoy the show! Don't worry about those strange sounds you hear or the uneasy feeling that comes over you. It is nothing more than the Heavy Metal Horror Show doing what they do best. It doesn't take long for the chills to begin as you are hit right away with the macabre anthem "Traipsing Through The Blood". Lead singer Brian Thomas will have your spine tingling as the first of their twisted tales take hold of you. Interesting also is the bands drummer Rob Brug steps out front and delivers a blistering six string solo. Wonder what other talents he has been hiding behind his kit! From there the band keeps the assault going and really hits their stride when they take you for a frightful ride into their "Terrortory". The title track is a dark brooding piece of heavy metal thunder that will definitely have you looking around the corner as they take you into the barren wasteland of evil. This is easily one of the highlights of the disc and the guitar solo by guest musician Billy Grey and main guitarist Don Guerrier will leave permanent scars! There is no real low points to the album. You may feel a certain similarity to some of the songs but this is mostly due to the fact that the band is trying to give the listener a feeling as well as hearing experience and a steady diet of heavy metal grinding is the best way to achieve it. They are relentless and this massive dose of metal will fuel many a head bangers trip to the chiropractor. This is not to say they don't branch out at all on the album. "Not One" starts out as a power ballad but quickly builds to a powerful crescendo before turning into a majestic bit of melodic metal. "Reinventing Fear" and "I Lie Awake" treads into territory where you might find the likes of Iron Maiden or one of the NWOBHM bands from the era. Then you have the acoustic/electric combination of "Hands Around My Throat" which gives you an almost progressive feel and the haunting piano ballad "Dead On The Inside" which may be one of the most frightening moments on the disc. They close out the album with an acoustic instrumental piece that is a kind of cool down after the workout that Halloween has given you. Believe me, it is needed! This is an album that only a band like Halloween could deliver. It takes a maturity and a skill level that is not commonplace in the music scene today. Sure there is some campy horror show fun wrapped up in this package but oh what a delightful package it is. Terrortory takes me back in a good way. It is a disc that I have no problem putting in the player and just leaving there. The band is tight and the guitar work throughout is electrifying. Guitarist Donny Allen who was with the band for quite awhile returns to add some of his amazing talents to compliment those of the gifted Guerrier. It is their efforts that really shine on the disc. This one seems much more guitar oriented and has a fierceness about it that really stands out. I wish there were more albums like this one. Lyrically Brian Thomas has done some of his best work and his vocals are as menacing as ever. Some albums just ooze metal and this one is as edgy and tough as the streets of Detroit where they come from.